My apartment complex includes a small gym. The Life Fitness Classic Series Elliptical Cross Trainer is the primary machine I use when I go there. It is very simple to use, even for beginners. Elliptical's are great for burning a lot of calories without being hard on your body. There are different interval settings on that machine that can really ramp up your workout! I highly recommend this simple yet effective machine. You will burn calories and lose weight! Performance Great performance. Comfort Elliptical machines are ideal for those who have knee problems! They put much less pressure on your joints when compared to something like a treadmill. 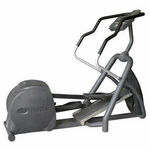 This particular elliptical is very smooth and does not cause any pain in your joints. Ease of Use This is ideal for beginners or those who are slightly technologically challenged. There are not a bunch of confusing buttons and settings like some other machines have. Durability Since this machine is in the gym of my apartment complex it gets a lot of use! I have been using this machine for almost 2 years and it has never had any problems. Design This machine has an average design. This elliptical is very easy to use and self explanatory. From the first time I stepped on there was no guessing on what buttons to push and how to get it to work. There are a variety of workout to pick from. My favorites are the interval trainings and one called Kilimanjaro, which simulates a climb up the mountain. One of my favorite things about this machine is that it is completely cordless. Not only does this make it easy and convenient for finding a spot for it in your home, but it also means that I am completely powering the machine to move. There is absolutely no added assistance from from an electrical source and this makes for a great workout. Another favorite feature of this machine is that there is an app for it. You can sync it with the machine and track you workouts. You can also connect, and charge, your ipod when you are using it. There is a built in keypad on the machine that will let you control your ipod from it so you don't have to mess around with it during your work out. 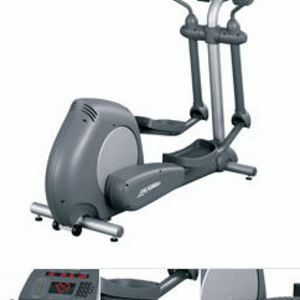 I am an avid user of the Life Fitness Classic Series Elliptical Cross Trainer. This elliptical performs great and it is comfortable to use, easy to use for anyone. To begin you put each foot on the elliptical's foot pedals select which program you want to use and then begin your exercise. I like the design but I also wish this Life Fitness Classic Series Elliptical Cross Trainer also included a television because that would definitely motive me to exercise for a longer amount of time. I would still recommend this Life Fitness Classic Series Elliptical Cross Trainer to anyone though! 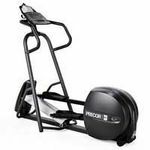 Performance The Life Fitness Classic Series Elliptical Cross Trainer has helped me reach my exercise goals by how well this exercise machine performs. 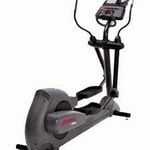 Comfort I have found the Life Fitness Classic Series Elliptical Cross Trainer to be comfortable to exercise on. 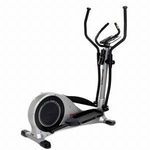 Ease of Use I have found the Life Fitness Classic Series Elliptical Cross Trainer to be very easy to use as a beginner and now as an avid exerciser. Design I enjoy the design of the Life Fitness Classic Series Elliptical Cross Trainer but I do wish that it contained a television for entertainment and motivation while exercising. this machine makes it easier to excersize. I love to excersize on this machine because it just makes excersize seem easier. You end up burning calories faster than an excersize bike or a treadmill because you are using both those movements at the same time and moving your arms at the same time too and it is just like using all those machines in one. Instead of spending nearly an hour on a treadmill and an hour on an excersize bike and doing pushups you can spend one hour on this machine and it does all of that! I use my machine several times a week and in the last six months, by just using it about four times a week for an hour, I have actually lost ninety pounds! I am so glad that I bought this machine it is so worth the money I can promise you that, I am still a pretty big woman but this machine is still helping me lose that extra weight I would like to lose. Performance It works for you if you commit to it at least three times a week. It works if you let it work. Comfort It can make you a little sore if you over-do-it when you first start. I have used more than my fair share of cardio machines and LifeFitness, by far, has some of the best equiptment. This machine is comforable, and easy to use, but still technical enough to give 10+ personal programs. It's very sturdy which is hard to come by in some machines so you feel safe. Quite possibly my favorite feature of this machine is the TWO sets of heart rate monitors both on the stationary hand rails and the mobile. It's also supprisingly accurate in comparrison to HR monitors on other machines. I've worn my chest strapped monitor and also taken my HR manually and the machine has never been off by more than 5 Beats per minute which says a lot. It also has a feature where you can set your target heart rate and it will adjust the resistance to keep you there. Over all this machine is my absolute best pick for an elliptical machine. It's not the smallest on the market, but sometimes good things come in big packages.